I have a location in my story, the design of which needs a reality check. As my ship cut across the waves a blurred grey smudge appeared in the distance, as the hours passed it became more distinct and it's true scope came into view. As we neared the end of our voyage a great cliff of jagged granite rose hundreds of feet from the relentlessly pounding sea and spread as far as the eye could see in either direction. The tops of the tallest buildings shining brightly in the moonlight peered down from atop the cliff. The face of the cliff, littered with windows glowed like the eyes of fey forest creatures and large towers ascended at intervals striped like a barber pole apparently carved from the face of the cliff. Directly before us a giant maw opened in the cliff the top jagged like the mouth of some vicious predator. On either side of the cliff massive braziers burned brightly in the night. There is more to the poetic description but I think that is sufficient to set the feel for the place. The city is built into, and on top of, a granite cliff. The cliff rises 500' (152 Meters) from the sea below. The granite cliff extends perhaps a mile in either direction (this can be adjusted somewhat if it matters) and should extend at least 1500' (460 M) inland. In the face of the cliff is a large cavern that can accommodate large two masted sailing ships. Tugs are used to tow the ships to docks within the cave. Inside there are stairways and elevators (both for people and cargo) that lead up to the surface. Inside the rock formation I am looking for enough space for approximately 1000 residents, each should be afforded 12'x 12' (.305 x .305 M) of floor space, dwellings are not all the same size. Living spaces are reminiscent of Bag End from The Fellowship of the Ring, though scaled for a normal human to walk without doubling over (8' ceilings) The underground portion will also require space for cargo storage. Atop the rock face is a city, where important structures are built from the excavated granite and lesser structures from both stone and wood from the surrounding forest. Points of consideration for the reality check. Can this much granite exist in one place, are there real world examples? Are there examples of dwellings carved into granite in the real world for the purpose of habitation? Are there concerns with this setup that I have not considered? There are many examples of these rock-temples in southern India. 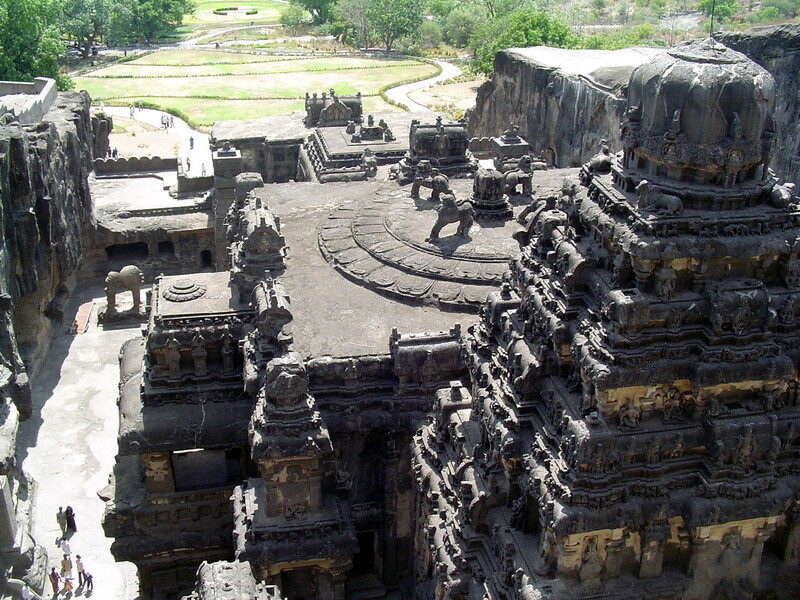 Above is a picture of Cave 10 at Ellora. Below is Cave 16 at the same site, called the Kailasa Temple. The temples are called 'caves,' some of them are dug into rock as if they were caves, some, like 16 are basically small hills excavated into the shape of a building. Cave 16 is 82 by 40 meters, and 30 meters high inside. An estimate of the total amount of rock removed in 100,000 cubic meters, just for this one of 34 caves at the Ellora site. 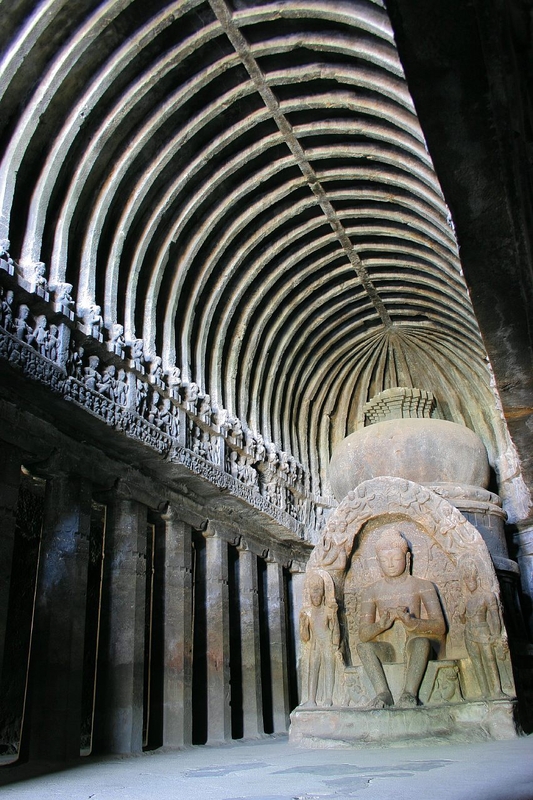 Ellora is just one of many from Maharashtra in India, including Ajanta and Pitalkhora. The Pitalkhora site was started around the 3rd century BC; building at each site went on for hundreds of years. The total amount of excavation at the bigger sites like Ellora and Ajanta is probably more than you would need to make your city. Basalt appears to be slightly denser, and proprotionately stronger, while granite is tougher so it would be a bit harder to mine through. Ultimately, the materials are pretty similar, so if Iron Age Indians could carve these temples in a century or two, they could also carve your city. Monumental cities carved in granite are realistic! A granite block of the size you ask for is totally feasible. El Capitan in California is certainly taller. Getting the living spaces you want without explosives or magic is going to be sufficiently expensive to be impossible. Cutting stone by hand takes a long long time. From personal experience, with a hammer drill and modern drill bits, it took the better part of an hour to cut a single row of holes about 6" deep. Medieval miners with poor quality iron or steel will take days or weeks to cut the same set of holes. To excavate the amount of material described will take forever. Making granite "caves" is usually done artificially by cutting up the rock into blocks then forming it into buildings. As most caves are found in rock types that dissolve in water and granite does not, some other mechanism will need to be used to create the voids in the rock. Without a very secure bay to protect the cave mouth, no captain will risk their ship. The scene describes pounding surf indicating that the cliff face extends far below the water line. While the deep water will allow large ships to approach the cave mouth, and even enter, no one would dock their ship there. Depending on the shape of the cave and without a harbor, the waves in the cave could frequently be larger than the waves outside. Big waves on the open ocean aren't too bad. Big waves are really bad when your ship can be thrown against a cliff face, even if that face is in a cave. Compare paintings of the docking density between the Thames River in the 1800s vs Boston Harbor. The Thames is absolutely packed! Why? Because conditions on the Thames are very placid. The risk of one ship inadvertently running into another was low enough that the density of docked ships could increase. Boston harbor doesn't have those kind of conditions. Thus, to prevent accidents, boats are anchored much further away from each other. Ignoring the waves, the tides will put a limit on the maximum height of the ships that will fit in your cave. Assuming a normal earth-moon system, tides may vary by as much as 3 meters. Actually granite rarely form caves, and never that big. Water erode the rock by infiltrating through the faults producing sand and large blocks but no cave. Nonetheless there are huge granite cliffs in Yosemite like the Half Dome. You can't really dig into granite, may be a stairway would be possible on the face of the cliff. Building with granite is possible you even have lighthouses made of this. On the other hand, compact lilestone suits perfectly, but it is completely white and a port in a cave is still dangerous. Not the answer you're looking for? Browse other questions tagged science-based architecture city or ask your own question. Can the soldiers upon this wall successfully withstand this enemy army?